Carmen Angel is an American-born chef with paisa roots (her father). Along with her husband Rob, she is the co-owner of Carmen Restaurante Medellín, Humo BBQ & Bar and Carmen Restaurante Cartagena. Here, she shares with us her favorite things to do in Medellín. My favorite restaurants right now are La Legumbreria and Naan. Both places are committed to quality and run by passionate people. They stay true to their concept and principles and don’t let themselves get bowled over by the local tendencies. They are staying true to themselves as chefs and as restaurants and that deserves a lot of respect in such a gastronomically traditional town like Medellín. Ok, and the food is really, really good! I am more of a cocktail girl than a coffee person! For that the cocktails at Humo BBQ & Bar are the best in town. As for friends, picnics down at Ciudad del Rio are nice as well as a little Mexican spot in the Containers, right on Avenida Las Vegas, called Chilaquiles. They have great tequila cocktails and great appetizers and tacos to share with groups. 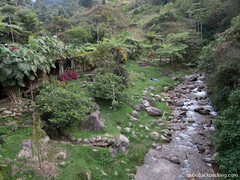 There is some good hiking at the Parque Salado in Envigado and I love going to Guatapé and climbing the El Peñol rock and cruising on the lake which is very relaxing and beautiful. To our family weekend home or finca. It’s like a breath of sweet paradise just one hour from the city. The minute we pull up it’s pure relaxation and it really is like a second home. 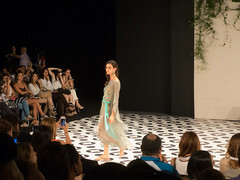 Colombiamoda is a great fashion fair and brings a lot of amazing designers from all over the world to Medellín. Also the Orchid, Bird & Flower Fair that is held at the Botanical Gardens every year is amazing. I can spend hours upon hours gazing at all the incredible diversity of flora. The Ciclovia on Sundays is the best! The main drag in El Poblado is shut off from cars and it’s a biker’s, jogger’s, walker’s and dog’s paradise. I love the MAMM and also the Museo Antioquia, their Botero collection is exquisite and their permanent collection contains several pieces by artists I know and whom are very close with my father so that is always exciting. As for some good American Blockbusters, the Premium Theatre at Cinemark in El Tesoro (Shopping Mall) has amazing reclining seats, seat service and a menú with appetizers, beer and wine. The Metropolitano, close to the Medellín convention center is an excellent venue for symphony and other special musical events the city brings. Photo of Carmen Angel used with permission. All other photos by David Lee. I like to read about new places , and other things to do ! thanks for this piece!